The human body piercing industry is estimated to be worth around $722 million, but many people experience complications ranging from localized infections and skin reactions, to more serious bacterial infections, traumatic tears, and even viral hepatitis. Trying to revolutionize the piercing industry and make it safer for customers is BioPierce Canada Ltd., a startup launched in 2016 by Hofstra University (New York) law professor Norman Silber and cardiologist Mark Nathan. In collaboration with Canadian not-for-profit research organization Mitacs and researchers at the University of Prince Edward Island (UPEI) School of Sustainable Design Engineering, the Souris, PEI-based company is using 3D printers to create small tissue scaffolds or “medicated sleeves” from biomaterials that can be applied to a piercing instrument. These sleeves stay in human tissue once pierced, and slowly degrade over time, releasing active substances to promote healing, reduce pain, and deter infection along the way. “The original concept was to reduce the rate of infection significantly, but it has blossomed from there to include novel ornamental possibilities in humans,” Silber says in a Sept. 6 press release. He came up with the idea after his 12-year-old daughter developed an infection after piercing her ears in 2002 and wondered why piercing guns weren’t designed to dispense anti-infective medicine from the inside out. A decade and a half later, and Silber’s daughter’s idea has become reality in BioPierce Canada. 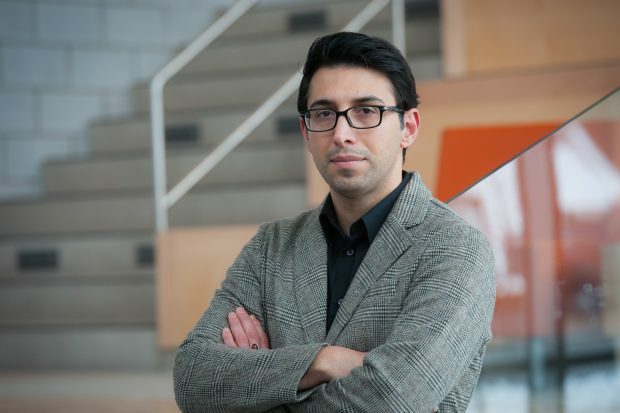 Dr. Ali Ahmadi, lead Mitacs researcher and assistant professor in the School of Sustainable Design Engineering at UPEI. Ali Ahmadi, an assistant professor at UPEI’s School of Sustainable Design Engineering, supervises Mitacs researchers as they work on BioPierce Canada’s technology, and says his goal is to make sure the device is versatile across various piercing instruments and industries. Silber foresees other potential applications in areas like livestock tagging and pet microchipping, and as a result, the company is still figuring out which applications to target first. He adds that BioPierce Canada is aiming to have its first product commercially available in three to four years. Ahmadi concludes by saying that the opportunity to work on commercializing a “groundbreaking piercing technology” is extremely exciting for both him and his students.